A man named Swan sits behind a one-way mirror, in a booth perched in the balcony of The Majestic theater. On the stage below, a man named Winslow Leach sneaks past security, and rolls a small piano into position. 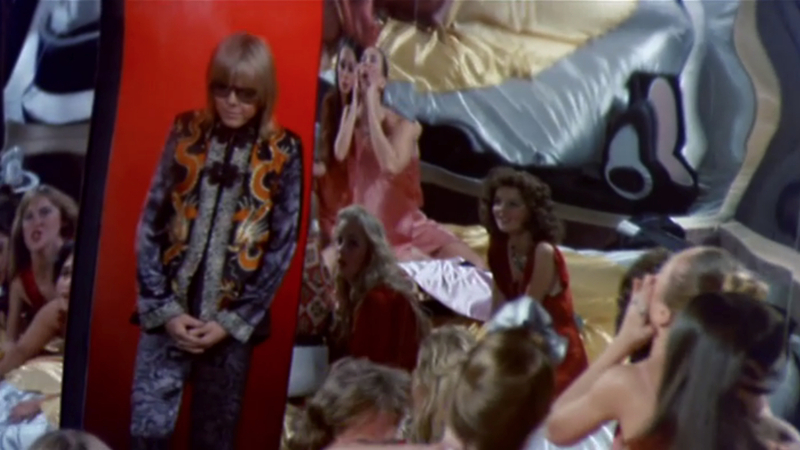 In one of the first scenes of Brian De Palma’s Phantom Of The Paradise, De Palma establishes the relative positions of his two main characters: Swan above, looking down, unseen except by those in his inner circle, and Winslow below, looking up, into a mirror. For a few moments, though, De Palma frames Swan and Winslow together. 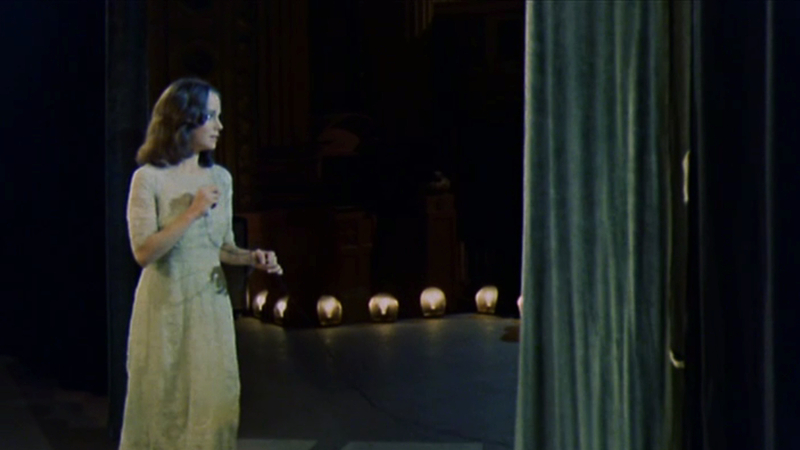 In a POV shot from Swan’s box—the POV indicated by a glimpse of Swan’s white gloves in front of the camera—Winslow is shown blurry in the back of the frame, singing his song and hoping Swan will notice. Soon enough, Swan will see him, and Winslow will come into focus. That’s where the trouble starts. Few filmmakers use split-screens as creatively as Brian De Palma. One year before Phantom Of The Paradise, De Palma’s 1973 thriller Sisters featured a doozy, in which De Palma not only showed a crusading alt-weekly journalist witnessing a murder, but also used the split-screen to insert one of the journalist’s cop-bashing columns, to cue the audience as to why the police weren’t in a hurry to answer her call for help. But De Palma is just as skilled at partitioning the screen without drawing a straight line down the middle. Throughout his career, De Palma has used split-diopter shots, layered foreground/background action, mirrors, windows, and other clever bits of set design to set his characters off from each other and from their environments. 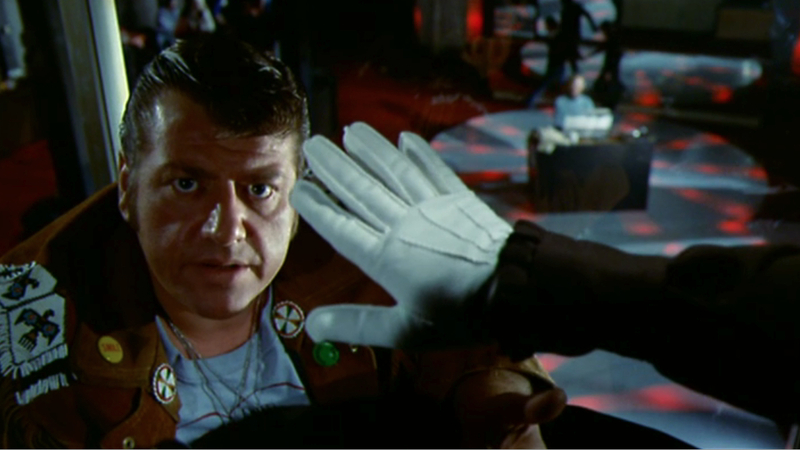 In Phantom Of The Paradise, De Palma breaks out some of those gimmicks for multiple reasons: sometimes to squeeze more info into the frame, sometimes to draw connections between the characters, and sometimes just to cue viewers that they’d better keep their eyes open, and not to assume everything about the movie is immediately evident. In its roughest outline, Phantom Of The Paradise is the story of a naïve musician who has his life ruined by an impresario: a one-dimensional cautionary tale about commerce gobbling up and destroying art. But Winslow and Swan—played by William Finley and Paul Williams, respectively—aren’t as at odds as the basic scenario implies. The characters share more than just the same space on a movie screen. The shot above comes shortly after Swan sends his lackey Philbin to retrieve Winslow’s work-in-progress cantata, Faust. Winslow immediately becomes persona non grata around all the various Swan offices and compounds, so he sneaks into “Swanage,” Swan’s mansion, and makes his way into the secret mirrored bedroom where women who want to become pop stars gather, to be watched by Swan and become his sexual playthings. In this scene, a secret panel opens and Swan enters from one of his many devil-red control rooms. The assembled women (plus Winslow, in drag), swoon over Swan, but similar to how Winslow performs beneath the mirror that hides Swan in Phantom’s opening scene, here the wannabes look at themselves as much as they look at Swan. As framed by De Palma, Swan is partitioned off from his public, in his own red box, to be admired, but not usurped. Swan hedges his bets by having a cop plant drugs on Winslow, which initiates a whole new nightmare for the songwriter. Winslow is sent to prison, where he has his teeth pulled and replaced with metal; when he escapes and returns to the offices of Swan’s label, Death Records, he has his head crushed and seared in a record press. That’s when Winslow hatches his plan of revenge. 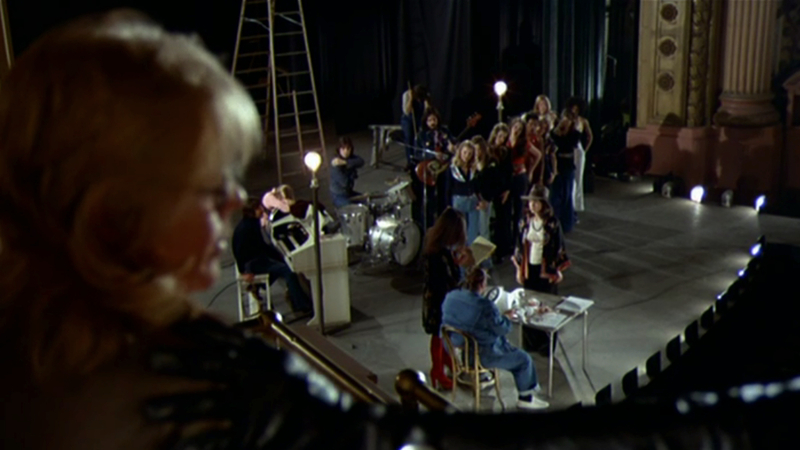 In Phantom Of The Paradise’s big split-screen sequence—a real split-screen, not just a split-diopter shot or a naturally divided frame—Winslow plants a bomb in a prop car being used during a rehearsal by Swan’s Beach Boys-esque nostalgia act The Beach Bums. Throughout the song, De Palma puts the sound of a loudly ticking clock on the soundtrack, as he uses the split-screen to track both the car and the performance, building suspense while making The Beach Bums look ridiculous. The side-by-side shots above show how De Palma designs split-screen sequences differently from other directors. The split-screen above shows two views of the same moment—one from the side of the stage, one head-on—creating a subtle sensation of spatial disorientation. The competing images also let De Palma reveal all the whining and wheedling that takes place backstage, just to get one of Swan’s shows on the road. Swan almost immediately ignores his promise to Winslow, and instead of using Phoenix, he hires a new act—a glam-rocker named Beef (Gerrit Graham)—to perform Winslow’s cantata at the new state-of-the-art theater The Paradise. Both Winslow and Swan watch Beef’s big debut from opposite sides of The Paradise: Swan is in his shadowy opera box, while Winslow is way up in the rafters, ready to fire a neon lightning bolt toward the stage to electrocute Beef. With Beef dead and the crowd at The Paradise in a frenzy, Phoenix walks onto the stage and sings Winslow’s music at last, changing the mood in the theater. Phoenix herself seems amazed by the power of her voice, and later in the movie tells Swan that she’ll do anything to get in front of an audience again. But the moment her first public performance is over, De Palma moves the camera subtly while the curtain closes, creating a barrier between Phoenix and her newly adoring audience, similar to the line between Swan and his groupies earlier in the film. 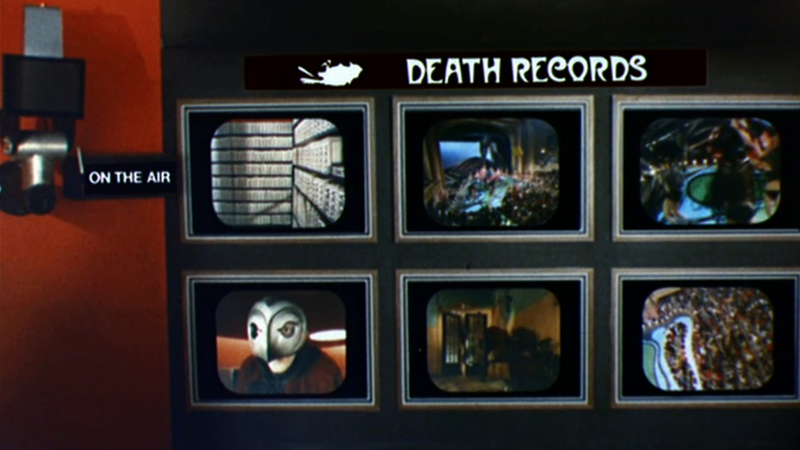 Another more classically defined split-screen sequence in Phantom Of The Paradise comes just before the climax, when Winslow sneaks into the Death Records archives and finds videotapes and surveillance footage that reveal the deal Swan made with the devil as a young man, as well as Swan’s plans to have Phoenix killed during a live televised wedding/concert. A lot of what Winslow finds out from peering into television monitors falls into the category of an “info dump,” and the use of multiple screens—as well as the way De Palma uses mirrors again to divide the screen, when the young Swan is talking with the devil—maintains some visual interest during all of the explanations. But the multiple monitors and multiple perspectives also reflect Winslow’s fragmenting psyche, as he tries to accomplish a growing list of goals: to protect his Faust, to save Phoenix, to kill Swan, to break his contract, and on and on. 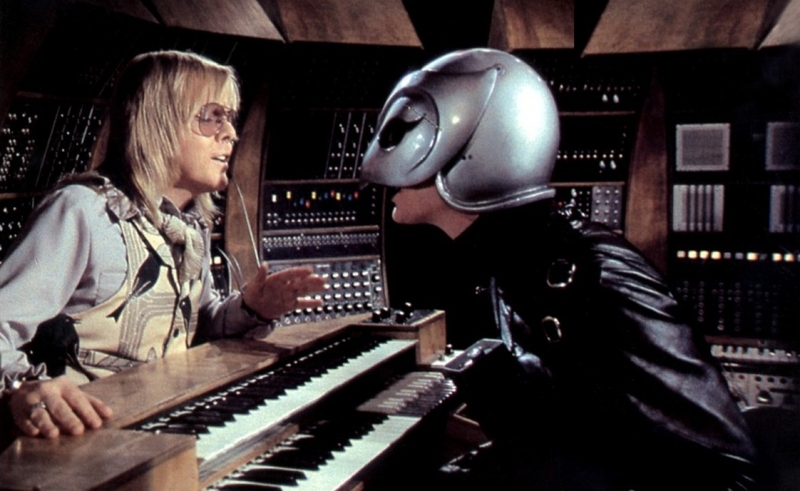 Throughout Phantom Of The Paradise, Swan cycles through different acts—The Juicy Fruits, The Beach Bums, Beef (with the backing band The Undead), and Phoenix—trying to capture the imagination of the youth, as well as to dictate their tastes. Swan believes that as long as he comes up with a novel sound, it doesn’t matter what the songs are actually about. (There’s a terrific sequence illustrating this about halfway through the film, when Swan hears one of Winslow’s songs performed a handful of different ways, before settling on Beef as the right voice.) The one constant throughout Swan’s different acts is an emphasis on lyrics about death, and evil triumphant. It doesn’t escape Swan’s attention that the kids go crazy when Beef is killed onstage, which is partly why he tries to orchestrate a similar situation with Phoenix at the end of the film. But Winslow stabs Swan, and because the two men are linked through their respective blood contracts, Winslow killing Swan means he’s also killing himself. 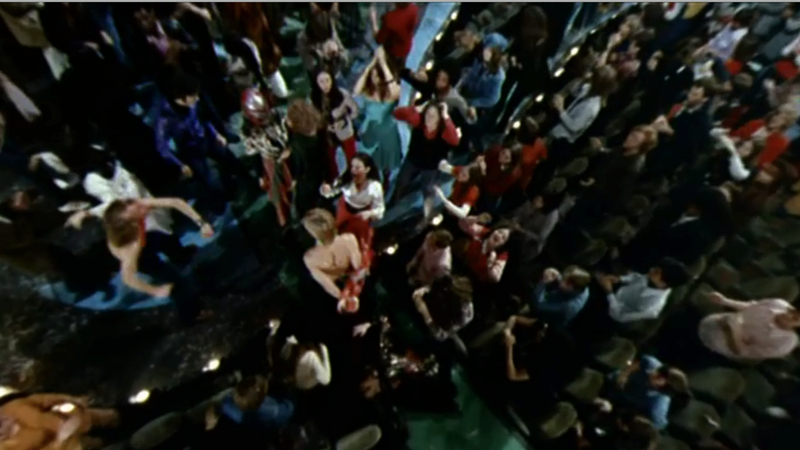 During the madness of their final showdown, the audience joins in the violence, attacking Swan and Winslow and passing around their respective masks. Swan is killed by forces he unleashed: by Winslow, and by the death-obsessed fans. In the last shot of the movie, the barriers between the performer and the audience are gone, and Phoenix embraces Winslow’s corpse as the camera pulls back from the two of them, until they’re indistinguishable from the young savages around them. It’s too simple to say Phantom Of The Paradise is about the conflict between artistic integrity and crass commercialism. Early on, Winslow tells Swan’s goons he’s “not selling anything,” and that he just wants to get his music out into the world. But even if he doesn’t want money, Winslow does want, and that’s what Swan exploits. Swan says to Winslow, “What choice do you have?” as the two of them go over Winslow’s contract, knowing Winslow isn’t going to sweat the details of signing away his soul if it means he gets to make his music. That’s how Winslow is culpable in his own exploitation—as is Phoenix, and as are the fans who idolize Swan and thus empower him. De Palma draws these more complex relationships through the shots of Winslow and others looking toward Swan—into his mirrors, or through his windows—while wishing they were in his position, also aloof and isolated from the crowd. Winslow is certain he’d use that kind of power for good. But he doesn’t. When he’s in Swan’s place, Winslow wreaks his own havoc on people’s lives. That’s an inevitability that De Palma sets up with the first image of Phantom Of The Paradise, of Swan’s Death Records bird-logo turning in circles. If De Palma stopped the logo sooner, the bird would look alive; instead, the bird ends up on its back, dead. The picture is the same, regardless. It’s just been twisted until it reveals its true meaning.